Freshwater inputs often play a more direct role in estuarine phytoplankton biomass (chlorophyll a) accumulation than nitrogen (N) inputs, since discharge simultaneously controls both phytoplankton residence time and N loading. Understanding this link is critical, given potential changes in climate and human activities that may affect discharge and watershed N supply. 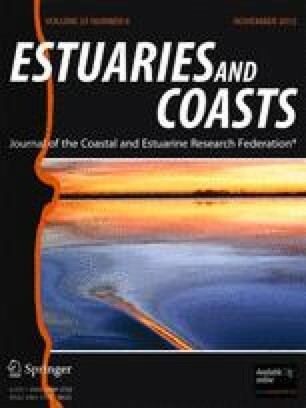 Chlorophyll a (chla) relationships with hydrologic variability were examined in 3-year time series from two neighboring, shallow (<5 m), microtidal estuaries (New and Neuse River estuaries, NC, USA) influenced by the same climatic conditions and events. Under conditions ranging from drought to floods, N concentration and salinity showed direct positive and negative responses, respectively, to discharge for both estuaries. The response of chla to discharge was more complex, but was elucidated through conversion of discharge to freshwater flushing time, an estimate of transport time scale. Non-linear fits of chla to flushing time revealed non-monotonic, unimodal relationships that reflected the changing balance between intrinsic growth and losses through time and along the axis of each estuary. Maximum biomass occurred at approximately 10-day flushing times for both systems. Residual analysis of the fitted data revealed positive relationships between chla and temperature, suggesting enhanced growth rates at higher temperatures. N loading and system-wide, volume-weighted chla were positively correlated, and biomass yields per N load were greater than other marine systems. When combined with information on loss processes, these results on the hydrologic control of phytoplankton biomass will help formulate mechanistic models necessary to predict ecosystem responses to future climate and anthropogenic changes. We are grateful to the many students and technicians who have helped with field sampling and laboratory analyses, especially B. Abare, J. Braddy, M. Hoffman, A. Joyner, L. Kelly, K. Rossignol, and R. Sloup. R. Guajardo provided invaluable assistance with volume calculations using GIS. We appreciate the critical and constructive comments from two anonymous reviewers. Funding for this project was provided by Strategic Environmental Research and Developmental Program (SERDP)-Defense Coastal/Estuarine Research Program Project SI-1413, the Lower Neuse Basin Association, the Neuse River Compliance Association, and National Science Foundation Projects OCE 0825466, OCE 0812913, and CBET 0932632. The views expressed are those of the authors and do not represent the policies or opinions of the US Department of Defense or associated military services. National Climatic Data Center. 2010. State of the Climate National Overview, September 2010. www.ncdc.noaa.gov/sotc/national/2010/9#SERCC. Accessed 20 October 2011.